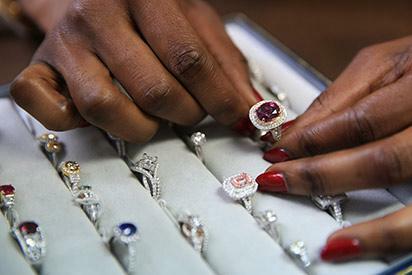 Cape Town – One of the world’s largest diamonds has been sold for 40 million dollars, mining company Gem Diamonds Limited said Tuesday. Nigerian-Jewish diamond cutter and dealer, Thelma West, poses for a photograph with a selection of diamond encrusted rings in her office in London on March 11, 2016. The company said the 910 carat diamond, which is the fifth-largest gem-quality diamond ever found and bigger than a golf ball, was sold on tender in the Belgian city of Antwerp to an undisclosed bidder. The “D” colour Type IIa specimen was found in January in the Letseng mine in the small southern Africa nation of Lesotho, said Gem Diamonds Limited. Lesotho is a small, impoverished country surrounded entirely by South Africa. The post World’s massive diamond from Lesotho sold for $40m appeared first on Vanguard News.